All your clean scrap metal can become useful material again. In this one-day workshop, you’ll learn how melt scrap or casting grain of fine or sterling silver, pour an ingot, then mill it into sheet and wire. You'll roll the ingot in the rolling mill and use a drawplate to make wire. 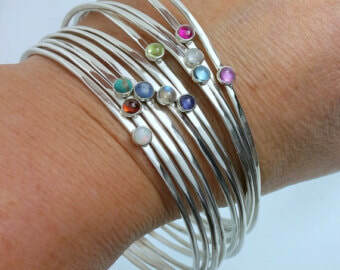 With only about one ounce of clean scrap metal you’ll be able to make some bangles with a bezel set stone. 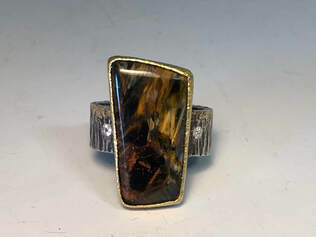 ​Chapin will also address bezel setting for non-traditional stones. Students should bring non-faceted stones to the class. This class should improve your knowledge of metalsmithing techniques. Learn to get the biggest bang for your buck and make a bangle from your scrap metal. Students should know how to use a torch to solder and use a jeweler’s saw. Students should come to class wearing closed toed shoes and avoid wearing polyester, as it can be flammable.